Down The Line (DTL) is one of the oldest forms of clay target shooting dating back to the late 19th century when the Inanimate Bird Shooting Association established itself as the first governing body for target shooting in Britain. The sport developed from the more customary live pigeon shooting and soon developed an active following who found it offered a much more affordable form of shooting. Today DTL ranks as the second most popular discipline in terms of registered targets shot and is considered as THE starting point for all trap shooting disciplines - virtually all top trap shooters began their careers shooting DTL before moving on into the international arena. DTL is a good discipline for beginners and experienced shots alike - it gives you many targets to break but also demonstrates the importance of stance, gun mounting and concentration when target shooting if consistent high scores are to be achieved. 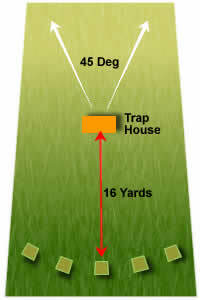 The ground layout consists of 5 shooting positions (pegs) 9ft apart in a 16 yard arc from a single trap house. The targets are fixed in terms speed and elevation but are variable from side to side to a maximum of 22.5 degrees either side. A round usually consists of 25 targets for each competitor which are fired away from the shooter and fly 50 - 55 yards. "Regulation" targets are set by ensuring the clay targets pass through a 3ft diameter hoop set ten yards along the centre line and 9ft high. Each competitor must shoot at 5 clay targets from each of the 5 'pegs' . Shooting alternately each competitor will shoot at the 5 targets before moving 'Down The LIne' - moving to the next position on their right (If a shooter is on position 5 they will go to peg 1). The shooter usually calls for each target with the gun already mounted in their shoulder and has two shots to break the target: 3 points are awarded for a first barrel kill and 2 for a second barrel kill. A perfect score would be all 25 kills being made with the first barrel thus 75 points would be awarded. This is usually abbreviated to 25/75. Big competitions can consist of 4 rounds making up 100 targets, a perfect score would see 300 points from 100 targets (100/300). It is possible to win a competition by breaking fewer clays than other competitors, two first barrel kills is the equivalent of three second barrel kills. A specialist trap gun is the undoubtedly essential equipment for shooting DTL no matter what level you are competing at. A common set-up would be a barrel length of 30 or 32 inches with a ¾ or full choke (a tight pattern is required because the clay is always edge on) that is set to shoot slightly higher than centre. This will allow the shooter a good view of the target over the rib which, as virtually all DTL targets are shot whilst rising, puts the target right inside the pattern. If the only gun available is a sporter, an alternative set-up can be made with a multi choke using the tightest tubes. The DTL Rules state that the maximum cartridge load is one ounce (28g) and a shot size of 6 or smaller. Typically a DTL shooter would favour size 7 ½ shot in a plastic wad and it is not unusual to find a size 8 in the first barrel. Single Barrel - As DTL but only one cartridge can be loaded per target. Scoring is simply the number of kills made. Double Rise - two targets are released simultaneously, one left and one right. Two points are awarded for a single kill and five for a pair. Handicap by Distance - Shooters are moved further back from the trap to a maximum 23 yards according to their CPSA classification. Scoring is as for normal DTL. 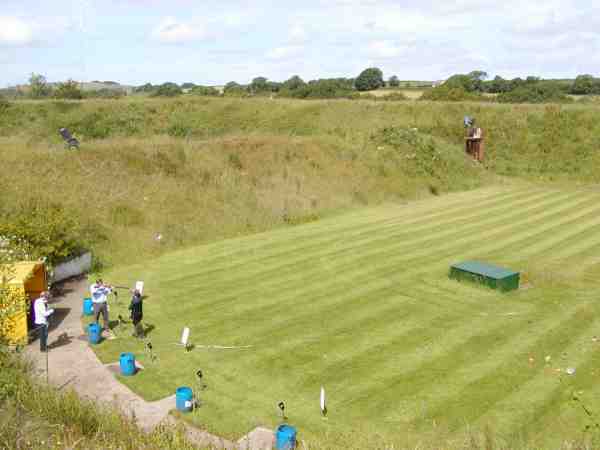 Mendip Shooting Ground's Main DTL layout. (Tuition session taking place).